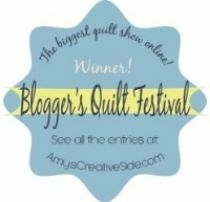 My Quilt Infatuation: Quilt Design Software, Winners, and Link Up Time! 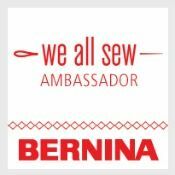 Quilt Design Software, Winners, and Link Up Time! It's Thursday again, and that means that it's time to share what you've been working on! I have been sewing up a storm lately, but the quilt I'm working on is a big secret, so mum's the word! The other thing I've been doing a lot of this week is playing around with quilt designing on the computer. I've been using a couple of different things and want to hear your thoughts. 1. It can be a little tricky to draw blocks to scale and layer the shapes properly. 2. It's not a quilt drawing program, so you almost have to have a block idea in mind before you start. So, here's the skinny on it- I absolutely loved drawing in Threadbias. It was pretty easy to navigate, and you can really create any block pattern pretty quickly. It figures out yardage requirements as well. I certainly haven't exhausted all of the bells and whistles of the program, but there is one fairly substantial drawback that I immediately noticed. I can't figure out if there is a line drawing function. For example, if I am creating a step by step diagram on creating a quilt block, and I want to show that you need to sew "corner to corner" (like you're making a snowball block) I would need to be able to draw a dotted line on top of the square to show where to sew. I don't see that function in the Threadbias program, so that makes creating actual pattern diagrams impossible. Someone please correct me if I'm wrong! By all means, if you've used this and know a way to do it, please let me know. If not, what programs do you use (besides EQ7, because I'm a Mac user!) 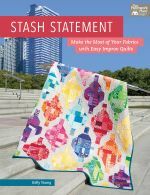 to design your quilts? Anyway, on to the winners of the fantastic giveaways offered up last Saturday. Thanks so much for the outpouring of kindness! Quilters really are some of the nicest people I know! There were a whopping 225 comment entries! Okay then, onto the winners- the winner of the fat quarter bundle from Five Monkey Fabrics is comment number 128! 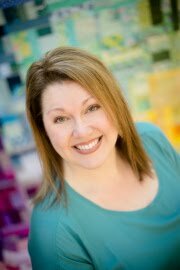 A long time traditional quilter I found your blog when researching the "modern" movement. Wow, was I impressed. Translating this movement to modern, fresh fabrics provides us veterans with a type of translator. I thank you. The lucky winner of the queen size Warm and Natural batting is comment number 45! And last, but not least, the winner of the Gracie Girl 7 inch stacker is comment number 98. Wow, only 8 months! That's impressive! You're on my blog reading list on blogger. I only found you a few weeks ago but I've really enjoyed browsing through your past quilts and reading all your current posts as well of course. I'll be contacting each of you by email soon to get your mailing address so you can get your goodies! Last week's party was pretty awesome! There is obviously lots of fun happening in your sewing spaces! Stephanie, at Quarter Incher's 100 Modern Blocks quilt is absolutely stunning! Stephanie at Simple Sewendipity shared this Riley Blake challenge showstopper mini! 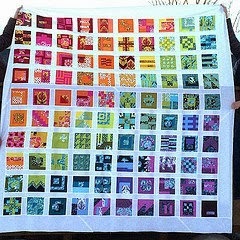 and My Pieced Life linked up her Tula 100 Modern blocks quilt too! No doubt about it- I love these quilts! I can't wait to see what you've got going on this week! Let's party, y'all! UGH. I've been looking for things too - I absolutely hate Photoshop and pretty much all the fancier components of Adobe. I've tried Threadbias and I had better luck with that than anything I've tried. I love your pattern tho - good luck! I use EQ7 on a Mac! I use it with Parallel which basically alots space to run Windows. EQ7 for Mac is due to be released this spring. So hang in there...It's coming soon! It is wonderful software. If you can't wait for spring, I highly recommend purchasing Parallels for $40. I downloaded a 30-day trial of parallels, and I had an old version of windows that I setup on my mac. I think I downloaded a 30-day free trial of EQ7 too. It worked perfectly! So I bought both Parallels and EQ7. I will migrate to the Mac version of EQ7 this spring. I get confused between the PC shortcuts and Mac shortcuts. There is supposed to be a smaller migration fee. I love EQ7 on my Mac! EQ7 on the mac is coming soon! I've been on the beta testing team and it works so nicely!! I had been using parallels and windows 7, but it is a little slow. I saw today that they are looking at it being out by March, they had planned on it being out already. Love the design. I still design patterns with pencil. paper and a calculator - and re-design while I am cutting and sewing. I'm going to look into a computer program this summer, I'm so slow to accept technology! Good luck finding the perfect program. I don't know how you do patterns in Word (I have a Mac too) but I like the way there is real clarity in the shapes of the blocks, as I often see something then work out what size or number of blocks of a pattern I might like to do. Interesting discussion to follow about creating patterns. Thanks. Congratulations to all the winners! About the designs, I use the Paint program that came with my computer (some use Inkscape) to do the drawings for making the patterns. I wish the quilt design programs would "do more" of the work for us. But they are a great design tool. What a fun, informative post to read! I enjoyed learning about the two programs! I just purchased the app called Quiltography. You can design your own block or use a template from their library. 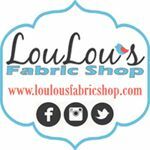 You can take photos of your fabric and insert the fabric into the block. I love that design you made it, what a great quilt that would become!! Hi Kelly, I use a combination of Microsoft OneNote and Visio though I've been playing with the Touchdraw app and it syncs with Visio too so that's a plus. For what you are describing I copy my image into One Note and use the basic drawing tools to mark up the image very quickly. To export it can be as a PDF which can be modified in photoshop elements or a screen shot (one note allows you to clip an image and saving as a png ) which can be uploaded to your blog. I keep meaning to look at Illustrator and am using EQ5 on my Mac with VMware Fusion but it is slow. I prefer Visio & OneNote for the moment. Beautiful design, Kelly. I am a mac user as well and I use Illustrator for my designs. That way I can work on embroidery designs and other drawing projects with the same software. Once I got over the learning curve, I really like it. Then I use Robert Kaufman's app to figure out the yardage. I feel your pain, Kelly! Not because I'm a Mac user, but because I would love to have user-friendly design software that you don't have to study for years to figure out! 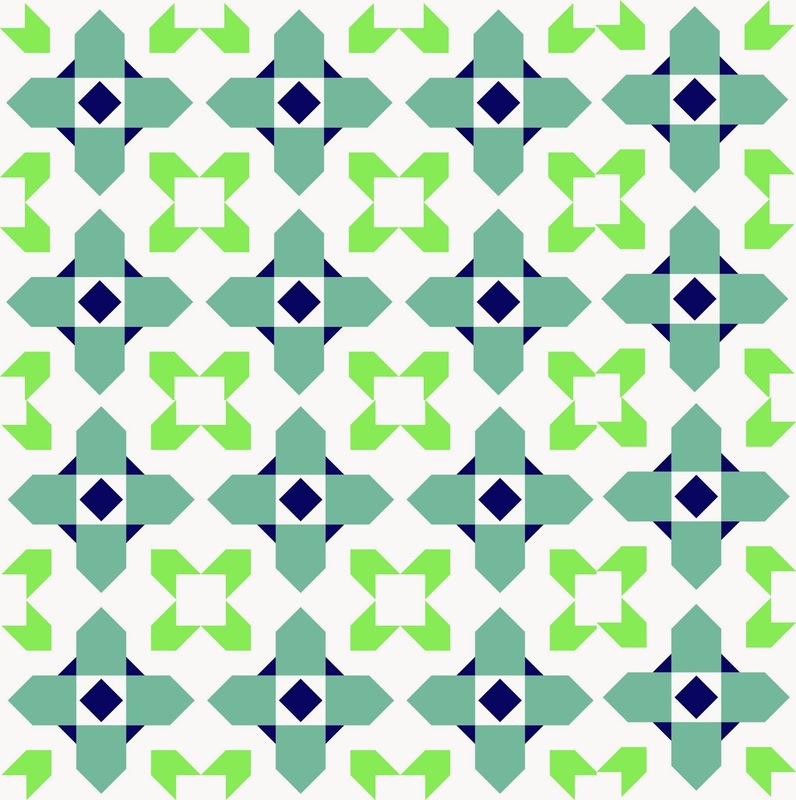 I own Illustrator, but I became so frustrated at trying to make patterns using it. I was spending hours and hours just doing the basic line drawings. Now, I just take pictures of each step and edit them in Photoshop Elements or PicMonkey. I also use Microsoft Publisher to create PDF's of a pattern with my edited photos. It's fairly easy to use. I'd love to make a "real" pattern, though, with line drawings and diagrams. Maybe I need a degree in graphic design! It's been great hearing what other people have tried. I love the fact that there is a program out there that calculates yardage! Thanks for the shoutout on my Tula Pink quilt. I love Needle and Thread Thursday! Thanks for hosting! 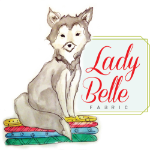 You made my day yesterday when I was reading your post and saw that I'd won the Gracie Girl fabric - hurray and thank you! Slight weather issues around here so although I have a quilt I'd love to link up with this week, it'll have to wait till next week because I haven't been able to photograph it. Your designs look great, that's not something I've ever tried. I think I might be more of a draw it on a scrap of paper and make it up as I go along kind of person! I like your quilt design! I have used Threadbias tool as well and I like it but wasn't able to be proficient at it yet! Thanks for hosting! 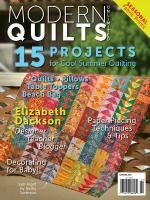 Hi Kelly, I've been searching the internet for an article that compares Quilt Canvas (formerly Threadbias) with EQ7. Do you have experience of using both? I've been using Quilt Canvas for a while but thinking I need to upgrade to EQ7/8. Any advice? I actually have never used EQ7. I have learned that they are coming out with EQ8, and I was thinking of checking it out though. My understanding is that it has LOTS more features than Quilt Canvas (which I still use and love), and there is a bit of a learning curve with it. 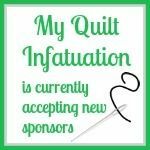 I know lots of quilters who use and love it though. 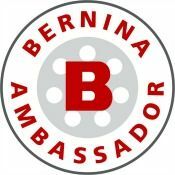 A Milestone, and a Few Giveaways!